The post-Super Bowl episode of Glee had an eye-catching opener, and I’m not talking about the cheerleaders shaking their booties in blue wigs, bikini tops, and pyrotechnic bras. I’m talking X-ups, tailwhips, backflips, and a slew of flatland tricks up front from Terry Adams. Check out the clip for yourself. The use of BMXers in a Cheerios routine surprised me. I always figured that if action sports were going to be featured on Glee, it would be alongside the unpopular “Gleeks” instead of the mean girl cheerleading squad. Then again, one of the Cheerios, Brittany Pierce, mentioned having motocross practice in a previous episode (I hope the show this in the future). For those of you who don’t follow flatland BMX, Terry Adams is the name to know. He won gold in the 2005 Asian X Games and has appeared on Ellen and Master of Champions. The Louisiana native also invented a crazy move called the Katrina, pictured below. 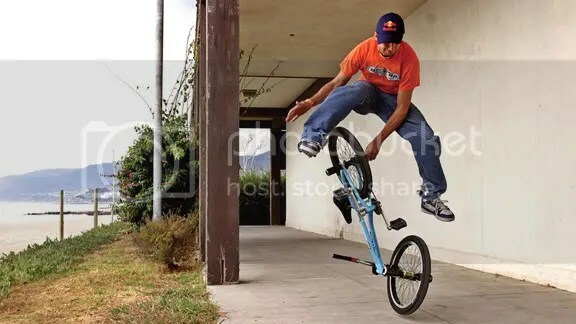 It involves him jumping over the frame of the bike while balancing on the front wheel. Terry had some interesting behind-the-scenes tidbits on the filming of the Glee scene. He also reveals that he started watching the show after getting his role and that his favorite character is Brittany. There are two versions of the interview: redbullusa.com and redbull.com. Terry’s answers are the same, but the questions are different, which I find very odd. Another odd thing related to this Glee episode is that there was a casting call for female BMXers, and yet I didn’t see any girls riding. Do you?